The products below made quite a difference in my life last year. Some of them seem quite simple, but upgrading little things that you use daily actually make a huge difference in your overall lifestyle. Most items are less than $20, with the exception of a few splurges. Enjoy! All photos are property of Amazon. Pasta Strainer: The easiest way to make pasta. The best part is you only end up dirtying one dish! Automatic Can Opener: Makes opening a can so incredibily easy! You'll never go back to using a handheld one. Cute Wine Glass: This was actually a gift for my step-mom. Isn't it awesome? Beer Thirty Wall Mounted Bottle Opener: Cute, funny, and comes in super handy! Espresso Set: If you have an espresso machine this set is a must-have! Very cute and came was packaged nicely. Cocktail Shaker Set: For anyone who is ready to get serious about mixing drinks! Spoon Rest: My boyfriend thought this product was stupid at first, but we use it all the time and he loves it now. It really helps to keep the stove clean while cooking. 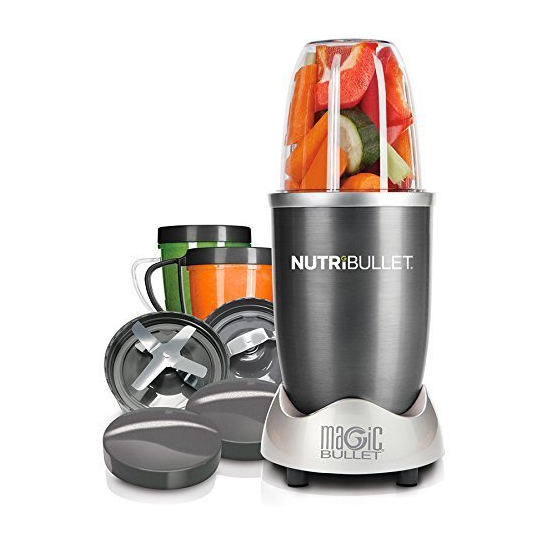 NutriBullet: This was a splurge for me and an upgrade from my previous mixer. It works better than any single-serve mixer I've ever had. 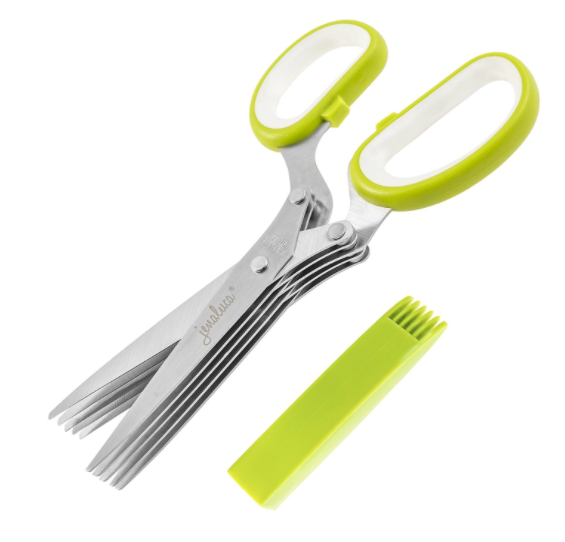 Herb Scissors: Sometimes difficult to clean, but makes cutting chives super simple. Sink Scrubber Holder: Must-have if you have a sink sponge. Allows it to dry without getting as moldy. iRobot Roomba 980: Necessity. Read my Roomba post here to see why. Apple Watch Holder: Props the Apple Watch up to see the time better and allows you to actually have a spot for your watch. GermGuardian Air Filter: We actually have two of these - I can't live without them! Pet Drinking Fountain: The dogs and cat love this fountain. With 3 animals we used to fill up the water bowl a lot. With this we only have to fill the reservoir 2-3 times each week! Dog Probiotic Chews: Probiotics make for a happy puppy mom and a happy puppy belly. Furminator for Cats: The best brush on the market hands down for long-haired cats. It's amazing. Baetea Teatox: Makes you feel so good throughout the process and after you're done! Vitafusion Beauty Sleep Gummies: I have insomnia and I just take one each night before bed. Each gummy is only 1.5 mg and it does the trick within 30 minutes or so! I like that it's not such a huge dose because I never feel groggy in the morning. Fish Oil Gummies: Fish Oil is so good for you, and I specifically love these ones because they are sugar coated and taste like candy! I could eat them all day! Sogocool Light Ring: Yes, it's a selfie light, but it also works wonders when you are alone and multi-tasking in the dark. I suppose there is also the flashlight on your phone, but this thing seriously rocks! Magnetic Phone Mount: I tried two other options before this one and it's exactly what I was looking for. A mount that is easy to stick my phone to and allows me to move it whichever way I please. Car Purse Hanger: Sick of your purse flying across the car everytime you slam on your breaks? Problem solved. Clear iPhone Case: I highlight this because this is the best phone case I could find that allows me to still see the rose gold back side of my phone. It's beautiful! Kolumbo Umbrella: This mint color is awesome and the umbrella is huge! Great investment. No Crease Hair Ties: How did I ever live without these!? Couples Q&A Book: A 3-year Q&A book for you and your significant other. Kind of cheesy, but fun and great for memories! Staedtler Marker Pens: Seriously amazing! I use these in my planner and they are the best pens I've ever owned.